On a warm and humid Saturday night, I found myself walking in the moonlit pathway of Citywalk. The last time I was there was during the last days of winter. I remember, my friends and I talked about how the place would be like on summertime. I said it wouldn't be perfect without the cool breeze, but the trendy outdoor mall in the heart of the city proved me wrong! Even in the peak of summer, Citywalk still has the cool relaxing vibe and the undeniable charm! I was there to meet fellow bloggers at Mo's, a casual restaurant serving American comfort food that we all have grown to love! I have heard wonderful things about Mo's. In fact, I have seen the restaurant almost jam-packed during my last visit at Citywalk. 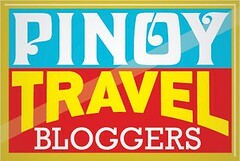 So, I wasn't just ecstatic to meet the bloggers, but to finally dine at Mo's as well! Mo's is located at Citywalk's prime spot overlooking the blue man-made lake and the fountain. The waterfront promenade is best for al fresco dining. But since it isn't the right season to dine outdoor, all tables by the lake were left unoccupied. As I always love to dine with a view, I'm really glad that Mo's tall glass windows offer an outstanding panorama of Citywalk's center-piece. I was still able to appreciate the beauty of the unique outdoor mall while I was comfortably dining indoor. Mo's is not your ordinary American diner. It is family-oriented, comfortable and casual just like the others, yet has a fancier appeal. The menu boasts an extensive selection for breakfast, lunch and dinner! They also offer a call and collect option which is really great as comfort food is best enjoyed while curling in the sofa at home. Since I was an early-bird that night, I had enough time to take some snaps and do a little chitchat with the staff. They were so kind and attentive. Every time I stood up to take a photo, a staff would pull back my chair and check if there's something I need. They even lent me a handbag hook! Exceptional service, I must say! I had dinner with Brigitte, Stacey and Tanya. Girls being girls, we talked about having healthy options but eventually decided not to think about dieting that Saturday night. B and I opted to have Caesar Salad and Queso Fundido. S and T, the regular diners of Mo's, chose their favorites Chinese Chicken Salad and Spicy Buffalo Wings. It's funny how we picked out favorites and changed our minds seconds after. It's so hard to choose as every dish has its own unique taste. The Caesar Salad is dressed in a special secret sauce and topped with tasty grilled chicken slices. The Chinese Chicken Salad has a variety of textures and is full on flavor. The Queso Fundido is a comfort food with a fancy flair. The Spicy Buffalo Wings is insanely zesty; quite messy to eat yet so delicious that I didn't care having the sticky sauce dripping in my fingers! So, please don't ask which one I love the most! I love seafood and I was so pleased that the girls love it as well. For our mains, we had Grilled Shrimps with Quinoa Salad, Simply Grilled Salmon with Mashed Potato and Tnt Shrimp Tacos. Just like the starters, the main entrees are exemplary! The juicy grilled shrimps were served on a bed of colorful quinoa salad and with lemon aioli dip on the side. I never had quinoa before, so I was glad to finally have a taste of the superfood that everyone talks about! I love the crunchy texture and the fact that it is healthy, hence I guiltlessly savored the nutritious and delicious dish! The Simply Grilled Salmon looked flawless. It was beautifully served on top of steamed vegetables and mashed potato (the creamiest mashed potato I ever had)! What I love the most is that the natural and mellow flavor of the fillet was not overpowered with herbs or seasonings. Actually, the wholesome fish dish is too perfect for words, so I'm letting a photo of it speak for itself! If I fell in love with the simplicity of the grilled salmon, I went crazy over the complexity of the Tnt Shrimp Tacos! Wrapped in a soft shell tortilla are battered shrimps drenched in rich and creamy piquant sauce. The six mini tacos came with guacamole, slaw and chipotle mayo. The first bite created fireworks in my mouth, no wonder it is named as such! It's the bomb! Here comes my favorite part: desserts! ;) I have always been eyeing Mo's Heavenly Honey Cake on Instagram, so I definitely must have it that night. Prior it was served, the girls and I candidly talked about a super delicious Honey Cake from a supermarket. We all thought it is the best in town. We eventually realized we were so wrong when we finally had the one at Mo's. It is soft, moist and perfectly glazed; truly heavenly! We also had a slice of Chocolate Decadence. It has a wonderful velvety texture and is chocolatey good! B, an ice cream lover, ordered The Classic Banana Split. The timeless classic has three kinds of smooth and creamy ice creams which are freshly made daily. No wonder I couldn't compare it to the commercially produced ones! Satiate that ice cream cravings with Mo's Classic Banana Split! 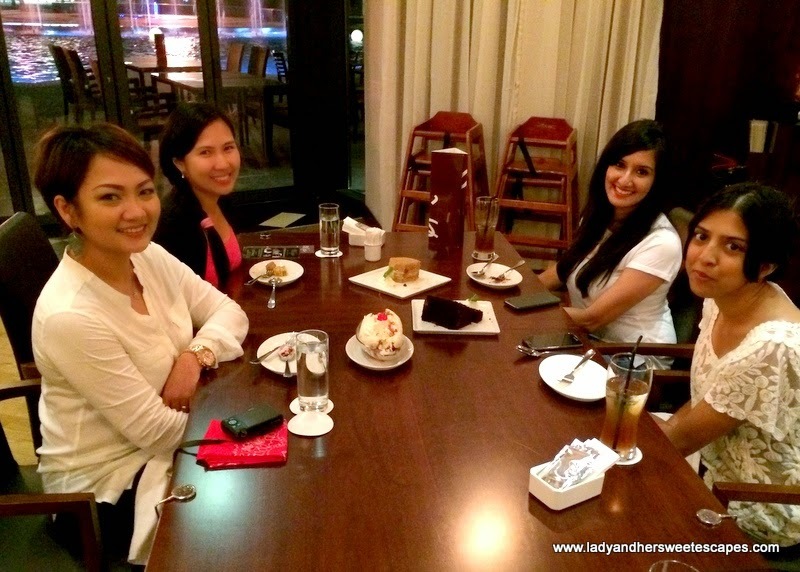 And so, the girls and I indulged while having a fun girl talk! Mo's is a upscale American diner, hence the prices are quite on my "splurge range". A complete meal (starter, main, dessert) may cost 150 AED or more, but I'd splurge over and over again for the wonderful ambiance, the great service and the scrumptious comfort food! Mo's has an Afternoon Indulgence promotion. You'll get 50% on the delectable desserts from Sunday to Wednesday at 3-7pm (except this Ramadan season). Follow Mo's on their social media accounts and get 25% off the bill. The promotions are valid for a limited time only. Please do check Mo's Facebook Page for current dining deals!